A top-down shooter in hell. The player must use their soul to fight demons, dodge saw blades and survive 66.6 seconds. Trick is: You can only move the character or your soul. A set of game pillars and player skills to test directed all design decisions relevant to the game's objective. This led to a focused and consistent experience that accomplished what I set out to do. 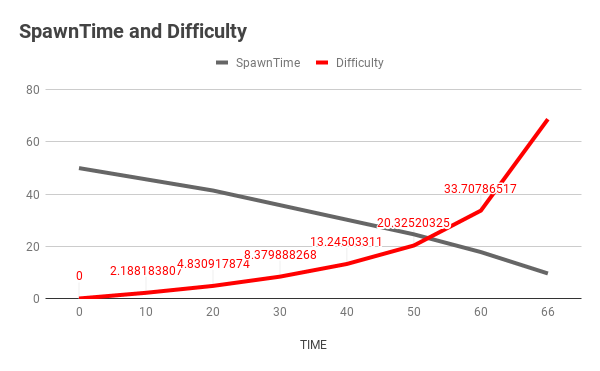 The difficulty curve follows a linear path between the start of the player’s flow state (around 30 seconds in) and 10 seconds before the game is beat. Those last 10 seconds increase the difficulty to almost twice of what is was. I called this section a “Panic State” because players tend to forget the strategies they have been building and side with pure reactionism. This effect was inspired by a particular moment in Tetris where the tower is nearing the top and players have less time to think about where to place blocks, increasing the chances of failure. This is a dodge ‘em up with the ability to eliminate your obstacles. Once I added the cost of movement to this ability, it was clear that it would break up the gameplay in 3 sections. Each influences the next in a loop: Dodging will dictate your position relative to enemies, your position will control how long you can shoot for, and your shooting will change how many objects you have to dodge.